Burgundy wine is essentially built on two grapes, Chardonnay and Pinot Noir, with vineyard locations playing a key role in the wine's ultimate character and expression. The highly regarded wine region of Burgundy ("Bourgogne" in French and on bottle labels, pronounced "Bor-gun-yuh") has welcomed oenophiles for centuries. Situated along the Saone River in the east-central portion of France, Burgundy stretches about 100 miles from the top (near the city of Dijon) to bottom (just north of Lyon), producing close to 193 million bottles per year from 68,000 acres under vine in the region's famous chalky, mineral-laden soils. Despite often unpredictable weather patterns, relatively small overall production numbers and somewhat limited availability worldwide, Burgundy evokes an almost mystical following. Burgundy is all about the place; like most French wine regions, the place name takes label priority over grape names. The names of appellations, communes, and domaines (wine estates) dominate the Bourgogne wine label, with little to no label regard for the key grapes contained within. While producer, negociant, and regional place names on bottle labels can be confusing for those that don't speak French, keep in mind that Burgundy is built on two grapes: Chardonnay and Pinot Noir. Burgundy's wine production breaks down to 61% white wines, 30% red, and 8% Cremant de Bourgogne (delicious sparkling wines made in the same method as Champagne). French AOC law dictates that all white Burgundy (aka "Bourgogne Blanc") must be made from the Chardonnay grape and likewise, all red Burgundy (aka "Bourgogne Rouge") are crafted from Pinot Noir grapes. Minor grape varieties add a bit of spice to the sea of Chardonnay (claiming 46% of Burgundy's vines) and Pinot Noir (rocking 36% of the vineyard plantings). These supporting grapes include Aligote (the second most planted white wine grape in Burgundy at 6%), Gamay (a black grape marking 11% of the region's vines) and Sauvignon, Pinot Blanc and Pinot Beurot accounting for less than 1%. While Burgundy may be significantly smaller in size, especially when compared to its equally celebrated neighbor, Bordeaux, the region's influence, impact, and overall importance on the international wine stage is substantial. Burgundy can be boiled down into five key growing regions or districts to know: Chablis, Côte Chalonnaise, Mâconnais, Côte de Nuits and Côte de Beaune. These last two districts, Côte de Nuits and Côte de Beaune, are collectively referred to as the famous Côte d'Or, meaning "golden slope" for the region's fall foliage, and represents the most well-known wine district of Burgundy. The wines of Burgundy maintain an impressive reputation for giving significant voice to the region's exceptional terroir. Elegant, subtle, complex, earth-driven, and filled with finesse, Burgundy's wines consistently maintain the prestigious paradigm and revered model for classic Chardonnay and Pinot Noir the world over. Chablis: Most famous for lively, mineral-driven, bone-dry Chardonnay, Burgundy's most northern region of Chablis is the white wine capital, cultivating Chardonnay vines on limestone-rich soil structures. The wines themselves are often referred to simply as "Chablis" around the globe or locally as "Beaunois" a Burgundian term for Chardonnay. Chablis' Grand Cru vineyards congregate on the sunny right bank slopes of the Serein River, while the Premier Cru vineyards tend to gather on south-facing slopes and are rooted in the famous white, chalky, crushed shell Kimmeridgian soils. It should be noted that Chablis's wine classification mirrors the rest of Burgundy in regards to Grand Cru, Premier Cru, and Village (Chablis) appellations with Petit Chablis added to the label mix as a well-priced, entry-level wine. Côte Chalonnaise: Known for solid, value-driven Pinot Noir, powerful, yet balanced white Burgundy and the regional sparkling wine, Cremant de Bourgogne, the Côte Chalonnaise rides right in the middle of Burgundy along the curve of the Saone River. Look for the village names of Mercurey and Givry on labels and producers such as Domaine Jabot, Louis Latour, and Faively. Mâconnais: Well-reputed for offering some of the region's best bargain Chardonnay, Mâconnais lies in the southern portion of Burgundy. Pouilly-Fuissé is the most well-known appellation in the Mâconnais, offering white wines with plenty of apple and peach, some tropical nuances and citrus notes along with fresh, vibrant acidity. Côte de Nuits: Located just south of Dijon and named for the town of Nuits-Saint-Georges, the Côte de Nuits produces world-class, iconic Pinot Noir with over 20 Grand Cru vineyards. The big name vineyards of Romanée-Conti, Chambertin, and Musigny, just to spotlight a few, are all found in the Côte de Nuits. The top of the Burgundian Pinot Noir line is found here, with wines worthy of aging for decades and prices carrying four and five digits for the crème de la crème. Côte de Beaune: South of Côte de Nuits and making up the other half of the Côte d'Or, the Côte de Beaune enjoys a 70/30 split of reds to whites. It's typically the white wines (again from Chardonnay grapes) that make their mark with rich aromas fuller bodies, and earthy herbal undertones overlaid by ripe pear and apple character. The wines from the Côte de Beaune deliver significant quality without busting the budget. Keep an eye out for wines from Chassagne-Montrachet, Meursault, Pommard, Volnay, and Puligny-Montrachet (all village names). When it comes to rolling with mid-tier to high-end Burgundian wines, the region's complex classification system will begin to play a critical role. Essentially there are four quality level classifications based on appellations that apply to all AOC Burgundy wines: Regional Appellations, Village Appellations, Premier Cru Appellations, and Grand Cru Appellations. Location, location, location - it plays the vital role in determining where the wines of Burgundy fall on the classification scale. 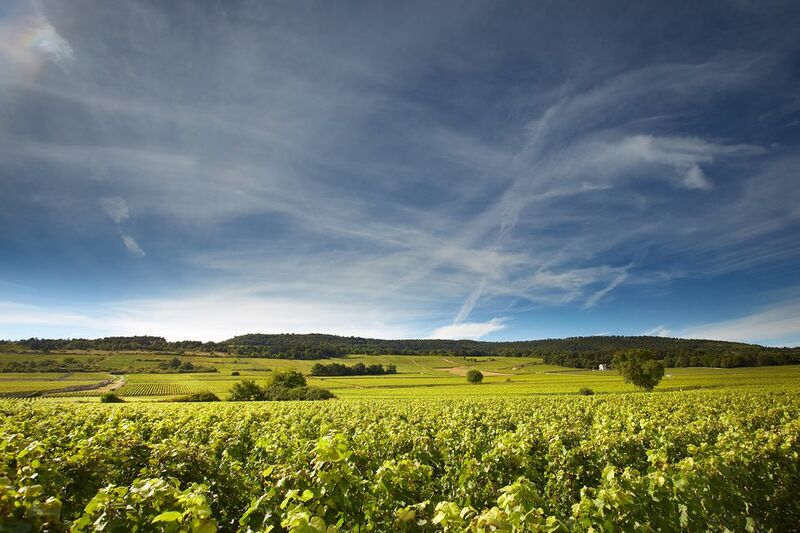 The term "Climat" (pronounced "Clee-ma") is a Burgundian term that lays claim to the extreme role that geography plays in Burgundy's wine scene. A Climat is a well-defined plot of land with very specific soil, slope, and micro-climate conditions. A Climat may be a whole vineyard or just part of one. The higher priced, esteemed vineyards or Climate top the classification at the Grand Cru and Premier Cru levels. Village wines carry the names of the village (i.e. Beaune, Chablis, Corton, Gevrey-Chambertin) that the vineyards surround. Good every day, entry-level wines with the regional appellation of "Bourgogne" may be sourced from vineyards anywhere in the entire region of Burgundy. Simply stated, the better the vineyard, the better the wine and the higher the classification rank (and price). Regional Wines - Like it sounds, the regional wine classification forms the base of Burgundy's classification pyramid, representing right around 50% of the region-wide wines. It should be noted that somewhere between regional wines and village wines, there is a sort of "catch-all" district rank that is more defined than the region of Burgundy, but not all found from a single village. Essentially, when a few larger regional districts are tied together because of similar quality they may be named as such. Côte de Beaune-Villages is one common example, indicating that the wine is made from grapes that come from one or more villages in the region of Côte de Beaune. Village Appellations - Weighing in with right around 38% of Burgundy's wine production, these wines carry specific village or town names on the labels (i.e. Pommard, Meursault, Mercury, Pouilly-Fuisse), indicating that the grapes are grown in a specific vineyard village location and not sourced from all of Burgundy. Pommard is a village name that you might see on a bottle label, communicating that all of the grapes were sourced from the village of Pommard in the Burgundian region of Côte de Beaune. Premier Cru - Climbing the classification ladder to the upper echelons of Burgundy's best wines with 10% of the production is the appellation designation of Premier Cru. Meaning "First Growth," Premier Cru refers to wines that have been grown in smaller, AOC defined and well-reputed vineyards to spotlight esteemed terroir (dubbed "Climat" in Burgundy). Labels often carry the shorthand designate "1er Cru" an abbreviation for Premier Cru. These wines are perfect when it's time to splurge, they typically start in the $60 range on the low end and work well into the $100+ price point fairly quickly. Grand Cru - Representing the top 1% of Burgundy's best wine offerings, with just over 30 vineyards ranked Grand Cru in the Côte d'Or, the Grand Cru wines command international attention. The most famous Grand Cru from Burgundy is undoubtedly Domaine de la Romanée-Conti which can easily ask $5,000-$12,000 per bottle on auction sites. With evidence of vines planted by the Celts before 200 B.C. and Roman soldiers growing grapes dating back to the first century, Burgundy was recognized early on as premier real estate for growing grapes. Yet, like many burgeoning European wine regions, it was the Medieval monasteries that deserve primary credit for cultivating the region's scholastic vineyards through the Middle Ages. Experimenting with grapes and land locations, and quickly recognizing Burgundy's epic influence, along with the dominating force of the regional terroir, the Benedictine and Cistercian monks served to identify and define the most ambitious vineyard locations of the region. These prestigious vineyards were destined to become some of the wine world's most prized grape-growing land possessions. While honing viticultural techniques and traditions, the combined efforts of Benedictine and Cistercian monks laid much of the groundwork for Burgundy's modern wine scene. It wasn't until the French Revolution that the ownership of Burgundy's vineyards transferred from the church and aristocratic circles to individuals in segmented blocks of land. The region's vineyards were further fragmented when Napolean sliced and diced the vineyards by instituting that all inherited land must be divided equally among heirs. To this day it is not unusual to find a 120-acre vineyard owned by 80+ growers, with as little as several rows of vines under the ownership of a single grower. This fragmented system has made the role of the négociant (a collective house that buys regional wines typically by the barrel to blend with other wines from the same region or appellation) extremely important. Remember that you won't find "Chardonnay" on the label of a Burgundy wine bottle, so you're looking for specific Chardonnay-producing regions, village, or estates (aka "domaines") names on the bottle. Chablis, Pouilly-Fuisse, Montrachet, Macon-Villages, and Meursault are top picks for white wine finds in Burgundy's vinous landscape. Similarly scout for the village names of Aloxe-Corton, Nuits-Saint-Georges, Pommard, Vougeot, Mercury, Vosne-Romanee, on a bottle label to point you in the right direction for Pinot Noir. Regional wines with the all-encompassing "Bourgogne" designate on the label will be the easiest on the wallet, next are the village wines which tend to increase quality and character for just a little more cash. The Premier Cru and Grand Cru wines from site-specific vineyard locations known for quality (and limited production) ask the most from consumers in terms of cash but promise to deliver bottled delight in return.